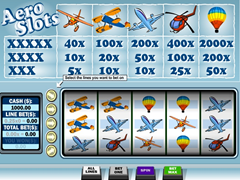 Aero Slots Pokie Review - Play Today! GameScale offers Aero slots in an exciting classic pokie that will charm you with its good graphics and then reward you for every winning spin with rich rewards. The game is all about flying high on emotion with profitable play on 5 reels with 5 paylines. The game offers a huge selection of winning combinations offered with colourful symbols. The big wins include the bonus jackpot round that rewards with 2,000 coins and the second highest win offers 400 coins. This game is considered a classic even though 5 reels are offered. The game will be able to provide players with a wide selection of wager amount as 5 lines are offered per spin. Not all the lines need to be played, but are required of the highest possible winning chances want to be achieved. The game will host a coin value from $0.10 to $2.00 per coins. With these values in place players will be able to gather a total wager from $0.10 with 1 line and a total of $10.00 with all lines activated. Winnings are multiplied by the selected coin value, which means a higher payout will be available when higher coin values are played. The interesting design of the pokie charms with a silver one armed bandit machine offering a large lever on the right hand side of the reels. The payouts is offered on the upper part of the screen and the reels takes the centre with the functional keys offered below the reels, which includes all lines, bet one, spin on a purple key and bet max on green. The symbols offers a flight to the big wins with an orange light airplane, blue and mustard plane, large blue airplane, red helicopter and a colourful air balloon with blue, yellow and red stripes. Players will be able to find a number of different winnings within the game when max bet is used. The game provides no features and cannot activate any bonus games. Players will be able to enjoy a classic pokie with great winnings and a wide range of wager options. The pay-table will be available above the reels to show the winning that can be achieved during the game. The game attracts a large follow of players who enjoys uncomplicated play and love huge rewards. Great colourful graphics and fast spinning reels keeps the excitement going in this great game.